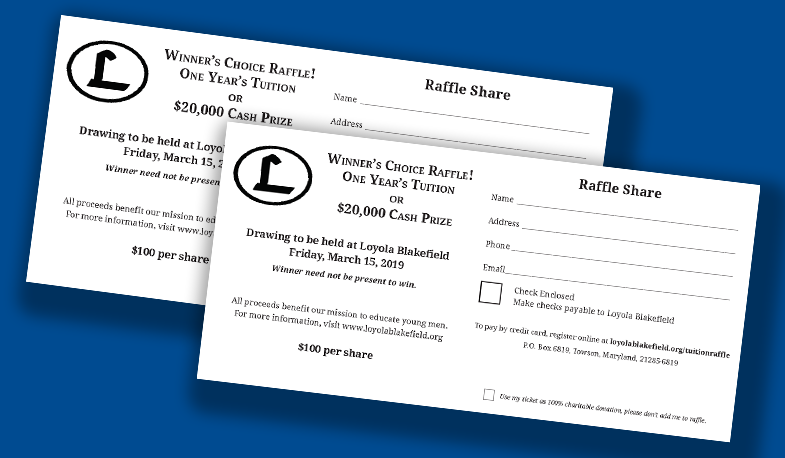 Loyola Blakefield | Annual Winner's Choice Raffle Has Begun! Annual Winner's Choice Raffle Has Begun! It is time for the annual Winner's Choice Raffle! Please participate by purchasing a ticket for your chance at a $20,000 cash prize or one year of free tuition for the 2019-20 school year. Drawing: The drawing will take place on Friday, March 15, 2019 via live stream from our campus. Don’t miss your chance to support our Dons and take a chance on this exciting prize. Each ticket sold helps us fund the formation of all of our students by supporting retreats, service work, co-curricular, and tuition assistance. Thank you for supporting this very worthy cause!